A 67-year-old Roman Catholic nun was excommunicated and ousted from her religious order last week after revealing that she had been secretly ordained a priest earlier this year and has since been presiding over Catholic rituals. Sister Leticia “Tish” Rawles, 67, underwent an ordination ceremony in April conducted by the Association of Roman Catholic Women Priests, a rogue group that broke off from the Catholic Church and asserts the right of women to be Catholic priests. The Catholic Church considers such attempts at ordaining women to be null and void. The Catholic Church holds that this is not just a matter of discipline, but part of the nature of the sacrament of orders. In 1994, Saint John Paul II wrote: “We declare that the Church has no authority whatsoever to confer priestly ordination on women and that this judgment is to be held by all the Church’s faithful.” The Church believes that attempting the ordination of a woman to the priesthood, even if performed by a Catholic bishop in good standing, has no sacramental effect. In 2007, the Vatican issued a decree stating that “both the one who attempts to confer a sacred order on a woman, and the woman who attempts to receive a sacred order, incur an excommunication latae sententiae reserved to the Apostolic See.” This would mean that Rawles was actually excommunicated the day she attempted ordination last April. During Pope Francis’ September visit to the United States, a group of activists approached him outside St. Matthew’s cathedral in Washington, urging him to ordain female priests. Some 50 members of the group Women’s Ordination Worldwide attended papal events in Washington in order to make their appeal. 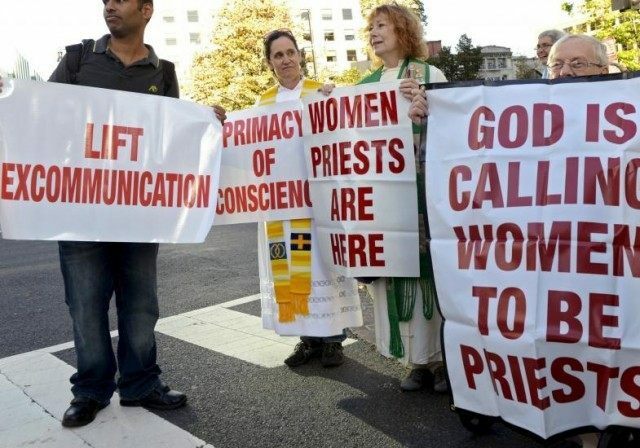 Some held up a signs calling for women’s ordination, while others literally lay down on the street in protest, resulting in several arrests as police warned the protesters they were blocking traffic. On the plane ride from Philadelphia back to Rome, Pope Francis was asked by a journalist whether the Catholic Church would ever have women priests. “Pope St. John Paul II after long, long intense discussions, long reflection said so clearly,” Francis continued. “Not because women don’t have the capacity. Look, in the Church women are more important than men, because the church is a woman. It is ‘la’ church, not ‘il’ church. The Church is the bride of Jesus Christ. And the Madonna is more important than popes and bishops and priests,” he said. In explaining her position, Rawles stated that she wanted to be ordained a priest before it was too late, and that had had this dream since childhood. “I thought that before I die, I want to fulfill God’s call and my life-long dream to become a priest,” she said in a statement on Tuesday. Sevre-Duszynska, a feminist activist, was herself formally excommunicated on March 31 of this year. The decree of excommunication from the Diocese of Lexington KY states that Sevre-Duszynska “attempted to receive sacred ordination in 2008,” and therefore was already automatically excommunicated by her own actions. The Church uses the term “attempted” ordination, because despite going through the motions, a person who invalidly receives ordination actually receives no sacrament. Although Rawles can no longer continue as a member of her religious community, the Sisters of the Precious Blood are ensuring that she will continue to receive housing and medical care.